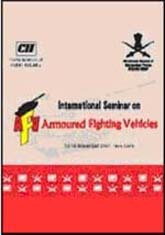 The Seminar on the Future Infantry Soldier as a System was held on 14 & 15 December 2008 at New Delhi. General Deepak Kapoor, PVSM, AVSM, SM, VSM, ADC, Chief of the Army Staff inaugurated the Seminar. Other key speakers at the Seminar included Lt Gen ML Naidu AVSM, YSM, Vice Chief of the Army Staff, Lt Gen Rajender Singh SM, VSM, Director General Infantry, Maj Gen Jasbir Singh, Additional Director General Infantry, Maj Gen Anukul Chandra, AVSM, Additional Director General (EM), MGO’s Branch, and Mr S V Gade, Sc”F”, Joint Director, Armament Research and Development Agency. The Seminar was focused on issues such as soldier modernisation programme - tactical imperatives; weapon subsystems; target acquisition subsystems; modernisation of the infantry – unit & sub unit level weapons & equipment; computer and communication subsystem; body armour, clothing and individual equipment subsystems etc. Over 350 participants from India and abroad participated in the Seminar.